Jeffrey obtained his master’s in Physical Therapy from Northern Arizona University after completing his undergraduate degree in exercise science. Jeffrey has completed both his CCRT from the Canine Rehab Institute and his CCRP from the University of Tennessee and now serves as a clinical instructor/mentor for both programs. He is one of a very few in the country who have completed both certifications. Additionally, Jeffrey has been a certified massage therapist through the New Mexico Apprenticeship in the Healing Arts since 1989 and has completed a number of specialized canine courses. His years in human PT were spent treating complicated pain, myofacial pain and orthopedic cases. While still practicing physical therapy on humans, Jeffrey’s own Mastiff had to undergo surgery for a torn cruciate. Following surgery, Jeffrey applied what he knew from his PT training to do rehab on her and his animal career was born. 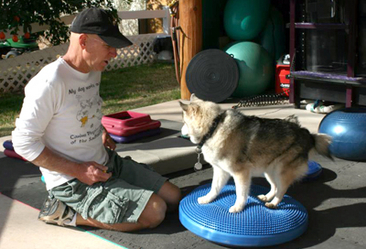 In early 2000, he opened Canine Physical Rehabilitation of the Southwest LLC, which he currently owns and operates. 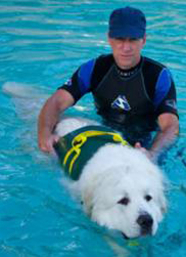 He presented on deep water aquatic rehab at the Fifth International Symposium on Rehabilitation and Physical Therapy in Veterinary Medicine in 2008. He instructed courses at the 2012 Symposium for Therapeutic Advances in Animal Rehabilitation on Neurological Rehab and also on Massage and Manual Therapy for Healing, Pain Reduction, and Restoration of Motion. Jeffrey coauthored the aquatics chapter in the newest edition of Canine Rehabilitation and Physical Therapy and has written for The Working Dog Digest and other publications promoting public awareness of canine rehab. Jeffrey has worked with a number of world team agility members providing expertise in conditioning as well as injury rehab. 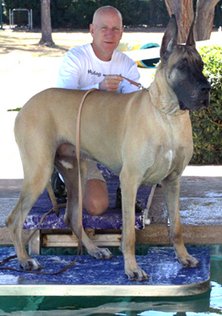 He has also conditioned a number of top show dogs for owners and professional handlers. He has attended a number of specialty courses in canine soft tissue mobilization including personal and class instruction in the use of TTouch for dogs. He also utilizes myofascial release techniques. Over the past 18 years, while providing support for his wife Karen at dog shows, Jeffrey has performed an extensive personal study of canine gait and posture. This is a skill that enables him to better determine your dog's rehab requirements.